Many believe it is the subconscious opinions you formulate within the first 3 seconds of an encounter that controls 90% of your feeling towards that event. Let’s imagine you are sitting there at your computer and you login to AILive the find the title listed above. The vast majority of you will formulate an opinion, biased or not, about the content put forth. What is your impression? “The Face of the Problem,” hitting the front page of a site covering one of the NBA’s most enigmatic and convoluted figures, a player many may view as a petulant superstar spoiled by the riches and lifestyle the NBA affords their employees. What is the first you think? The point is rather simple, and you’re parents, teachers, mentors, and role models have been reinforcing this assertion since you were walking the earth with a diaper. Don’t judge a book by its cover. If you are on this site absorbing some of the best coverage on Allen Iverson available on the net today, I bet this motto rings so loud it blows the tweeters. After all, the typical person, be they a fan of basketball or not, might take one look at AI and assume the worst. He carries the chip on his shoulder for all to see, and his heart isn’t just on his sleeve… it’s inked all over his body. 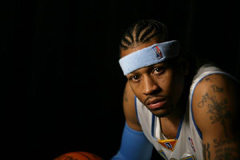 The typical person, unwilling to shape the judgments made in the first 3 seconds of meeting the presence known as The Answer, will take the title, “Face of the Problem,” and run with assumption that the writer views Iverson as the embodiment of everything wrong with the NBA, today’s professional athletes, or the youth of America that counts AI has a hero. If that’s you, I have no worries. You left this article about two paragraphs back and headed to the rantings of some loud-mouth political kamikaze or some other sports writer with a safe and conservative view of the game. The truth is this, and it is a belief I have held for some time. Allen Iverson is, in my mind, the face of the problem. He embodies many of the aspects and realities of today’s NBA that I believe deter the league and keep it from realizing the full support of those that are and could be fans of the game of basketball. However, it’s not the cornrows. It’s not the tats. It’s not the bling, not the stubborn refusal to take practice seriously, and it’s not AI as a person. It’s the player, and more to the point, it’s the NBA’s “evolution” away from the gifts and talents AI and his position bring to the floor. Consider this: Iverson was traded to the Denver Nuggets on December 19, 2006. Carmelo Anthony was watching games from his couch on suspension, the Nugs were struggling to find an identity without the baler from B-more, and the move was made with the attached expectations that the Nuggets would thrive with their newly-acquired superstar (or at least they would compete and keep the Nugs in contention) until Melo rejoined the scene and the true power of the duo was unleashed. Since that day, the Nuggets have posted a record of 23-27 (as of April 4th). Not really what fans expected, and as you might guess, many of the pundits assumed Iverson wasn’t such a great addition. As usual, folks want to assume the worst of the individual. They want an easy place to point the finger, an easy answer to the problem, anything to avoid the truth. That truth is either too much to bear or the pundits are too ignorant to realize it (though the successful teams of today’s NBA should make it crystal clear). That truth I keep mentioning was in full display last month. Some of you might have caught it. Some of you are too dedicated to the NBA and may have missed it. If you watched the NCAA Tournament and took in some of the madness of March, you should have seen it. It may have seemed a bit boring, all of the favorites consistently moving forward and advancing in a tournament that played to the chalk. However, there was a deeper message. The top teams advanced for a reason. Yes, they are more talented. They draw better players, enjoy better training facilities, endure tougher schedules against established teams on the same level. All true… but think about it. The top teams the earned a spot on the big stage (Georgetown, UCLA, Ohio State, and the NCAA repeat Champion Florida Gators) all shared one common thread: They all flourished under the leadership of quality guards. Every single one of those teams carries some of the more talented guards the college game has seen in some time. UCLA thrived off the play of their guards (Darren Collison and Arron Afflalo), both offensively and defensively. Georgetown’s guards (Jon Wallace and Jessie Sapp) earned praise as some of the most underrated players in the tournament. Ohio State had Greg Oden, and while he’s going to be the first pick in this year’s NBA Draft, it was PG Mike Conley, Jr. that drove the bus to the finals and served as the Buckeyes’ go-to player. In Florida, you were presented with a different situation. The guards (Taurean Green and Lee Humphrey) were certainly crucial in their success, but it is a player listed at forward I would suggest you view as the point man. His name is Corey Brewer, my favorite player not named Kevin Durant in this year’s NBA Draft. This kid should be the third pick in the draft. At 6’9” he may be labeled as a tweener, but he is more than capable of running at the 1 or 2 in the NBA and his skills as a shooter, with the hustle and distribution skills of a 6’2” guard, should garner a ton of attention from NBA teams in need of a leader. The kid carries some of the best overall skills you’ll find in this year’s draft. It’s a fact: The guards make the game, and basketball is 10 times more enjoyable when a talented player is leading the team from the point. You don’t make a hot dog without mustard. You don’t have Destiny’s Child without Beyonce. You don’t have Sanford and Son without Redd Foxx. You don’t have the Stooges without Curly. You don’t have top-shelf basketball without the point guard. They are the show and they make everyone around them better. Now come back to the NBA. Where are the guards? Over half the league fails to post a decent PG in the starting lineup, and that speaks volumes. Think about it… think… and name the top PGs in the game. You won’t get three or four names out of your mouth, and the guy at the top of the list is our man, Allen Iverson (if you want to bring Steve Nash to the table, I understand… a debate for another day). It used to be Jason Kidd, and someday it will be Chris Paul or possibly Kirk Hinrich. Right now, it’s The Answer, an immense talent in a game that has no idea how to utilize the position for all of the value it brings. Forget the entertainment value (though that’s almost impossible… the best games you’ll ever watch ALWAYS bring a top PG to the stage) and just look at the game. You need a man to run the floor, control the pace, hit the open man, distribute to post, set the flow, hit the trey when the lane collapses down low… you NEED the PG. For reasons I can’t explain, the league has, in large part, gotten away from this. The days of the dominant PG seem long lost. As a long time fan of basketball, and as a man that demands excellence from sports entertainment, I watch games with PGs (or at least players that fill that role in the traditional sense) and always have. Go through the best teams in history. The Celtics had Dennis Johnson. The Bulls had John Paxson and Steve Kerr. The Lakers had Magic (and I know, he wasn’t a conventional PG, but he assumed the role and did the job of the PG… and was, without a doubt, one of the best we’ve ever seen). Fast forward to today and the dominant teams of the NBA (all three of them) have it (the Spurs have Tony Parker, the Suns have Steve Nash, and the Mavs have Devin Harris and Jason Terry). There is a reason the league runs off three teams… so few carry a PG capable of doing the job right. I view this as the biggest problem the league faces today. That is why Allen Iverson is the face of the problem. He’s the league’s top talent at a position pushed to the shadows. The Nugs will figure it out. If you reached these words, you already know. Bryan Douglass is the Managing Editor for Sports Enthusiasts Media and the Senior Editor of Sport Eye Publications, bringing various forms of coverage, analysis, and entertainment to the world of sports media (including websites like StatFox.com and FFChamps.com as well as publications like The Platinum Sheets and College & Pro Football Newsweekly). He’s covered the NFL, NBA, NCAA football and basketball, and various other sports and topics since 1998 and continues to provide some of the best analysis and editorial insight in the industry today. He resides in Denver where he and his family enjoy The Answer up close and personal. Feel free to drop him a line or share your thoughts via email, Bryan@alleniversonlive.com.